Everyone seems to be so much happier around Christmas, everyone gets into the festive spirit and are up for having fun, people are cheery and a lot less grumpy! It's no surprise to people who know me that I have a sweet tooth and at Christmas, there's so much chocolate around and it's totally acceptable to eat as much as you like. The one time of year when it's okay for everyone to wear garish clothes and the more outrageous the better! They're so much fun and helps share the Christmas spirit. They're super cheesy and easy to sing along to, so what's not to love? As soon as December 1st comes, I start blaring out the Christmas tunes - they never get old! I don't think I'll have much time to bake this year, but I love baking around Christmas time, gingerbread men and mince pies are a favourite to bake (despite hating the taste of mince pies). I know this is a bold statement, but I genuinely think the smell of Christmas tree is the best smell ever! Every year we get a real tree and it just smells incredible, nothing beats it! Everywhere looks so pretty at Christmas as it's all lit up, I used to love watching our local Christmas lights being switched on every year when I was younger. For me, Christmas is all about family. Every year, we spend it as a family, whether that be just the four of us or with extended family, but for me it's such a special time. It's more important to me now that my brother is at uni as its nice to have him home and be a united family again. I LOVE Christmas parties. I had my first proper work one this year, which I absolutely loved. However, I've had many in the past with friends, uni societies and youth group etc. I love having an excuse to dress up and indulge myself with more food! 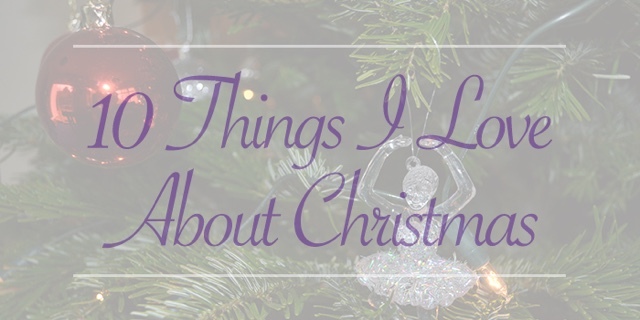 Let me know in the comments what you love about Christmas, I'd love to know. I hope you all have a lovely Christmas!